a journal of finding good food and restaurants i love to eat in Taipei when I'm not in Los Angeles. looking forward to hearing from other food lovers about where your favorite places to eat are, so i can try them next! My most recent burger adventures is 1885 Burger Store (2009), picked as our lunch spot by my friend Karen. The decor feels somewhere between Western and a diner, with a few chandeliers thrown in. Maybe they couldn't decide on which Americana kitsch to go with and decided to just go with both. But it's roomy and comfortable with lots of booths with some table seating to accommodate large groups. You can flip through the Ikea framed menu for the various burgers and breakfast, or choose from the daily special menu or from the chalkboard (which saves you about NT$40 by giving you a free refillable soft drink). The pineapple bbq grilled chicken burger I get, but what is a Mexican Tartar burger? Since it was Tuesday, I went with the Mushroom Cheese Burger set (NT$200) and was pleasantly surprised to find that I could change the cheddar cheese to Havarti (or Pepper Jack or Blue Cheese). I chose the wheat bun, but you can also choose a roll or white bun. We also upgraded our drink to a Chocolate Banana shake to share. Other milkshake flavors include Green Tea, Strawberry, Vanilla, Chocolate and Hazelnut Chocolate or you can get a smoothie. 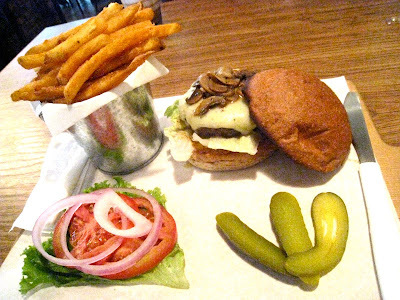 It didn't feel like we waited long for our food and the burgers came plated on a large wooden board with a handle, with fries piled high on a silver pail, and a fork and knife. The pickle was sliced thin so you could put it in your burger. From looks alone, I was happy with the ratio of toasted bun, burger and accompanying tomato, onions and lettuce. I hate it when the patty is tiny and the bun is huge, or the restaurant skimps on tomatoes. The first few bites were unusually peppery- I guess they season their patty stronger than usual- but it faded as I kept eating. The seasoned fries were also crispy and hot and filled about half the pail, which was more than enough. The burger was also satisfying juicy as I must have used at least 5 or 6 napkins to wipe my hands and mouth. I felt like Padma in a Carl's Jr commercial looking for a white shirt to dirty. Quite close to the Shida night market and National Taiwan University, it was packed full of camera snapping diners and groups noshing mostly on burgers. I'd definitely return here with friends and take them to Yofroyo for dessert, especially since a few of my friends have been unhappy with the size/value of California Grill lately. That's the power of supply and demand- more options to choose from and getting to discover new favorites. Ooh, I like the idea of green tea or hazelnut milkshake! The burger looks good too. now that you mention it, a new burger place set up shop on Minsheng E. Road and I've been meaning to check it out. Didn't know it may be a trend, but I ain't complaining. I saw this place last weekend when I was eating nearby at the Upstairs Cafe at A La Maison (a perfect spot for a warm, sunny day- their grilled chicken salad with asian dressing and a Heineken was perfect!) and wanted to give it a try..thanks for the heads up! christina: i was pleasantly surprised! koji: hmm, you'll have to let me know how you like it! andrew boyd: upstairs cafe? grilled chicken salad sounds good! dennis: thanks. the fries were good! crispy and hot. burger looks good. will definitely try it!! I had lunch there a month ago with a friend. He said he'd go back the next day. They also have good service. I've been browsing your entire collection on food in Taipei and wondered where I should begin thanking you. OMG you're a total godsend. I can't read chinese but can speak and am basically counting down the hours till i'm in taipei. Thanks for the awesome recommendations and maps. I totally noticed the burger rise this time to Taipei! It's great that there's others besides McDonald's and Burger King to represent this American culinary icon. Now Taiwan might get an idea of what a real good burger can taste like. 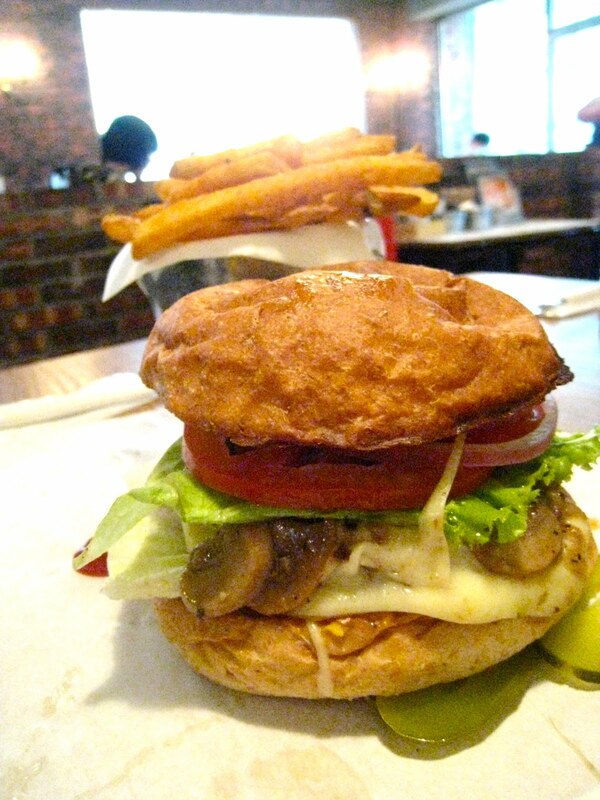 Great looking burger,esp in Taiwan. What's your favorite burger places in LA? Probably my fav. burger place in Taipei. I ate there once and discovered 1/3rd of the way through that my hamburger wasn't done. I pointed it out to the waiter and he took it back right away and gave me a new one. Totally expected for some places, but I've had that not happen to me in Taiwan before. Evans has their special every wednesday.. from 11-4pm $100 for their Cheeseburger.. and weekend they have a breakfast special before 10:30 or 11:30 (i forgot).. 40%off..
i have yet to try this burger place.. I'll try it! thanks..
btw, there's another burger joint.. Pickles..
taufulou: thanks! it was good! MJ Mama: go on a weekday, it'll be less crowded! Patrick Cowsill: i've been thinking a lot about it since i've eaten there too! Yenswky: thanks for your comment and reading! my chinese reading/writing is not so stellar either, so that's why everything is in English.. hope you'll come back and comment on your fave finds. ac from dc: haha! thanks for confirming it! i'm definitely happy about it. Kung Food Panda: hmm, i don't eat a ton of burgers while i'm in LA. the counter is good, the foie gras burger at Animal is decadent. i'm pretty happy with any local burger place in west LA. Anonymous: that's awesome. thanks for sharing. i've definitely eaten at a lot of places where they don't really care. c'est moi: pickles huh? i can't keep up!! Hello. I always enjoy your blog! On joanh's recommendation, I headed out to Shida and tried out both 1885 and the nearby (also recommended) yofroyo. Thumbs up to both reviews! We loved this place too. Reasonable prices, refills on drinks, (Key to Americans! We are thirsty people.) and a great burger. The fries were especially good, too. That's true - especially if you come from the West Coast where refills are usually free. I, too, can't stop thinking about those seasoned crunchy hot fries! I tried the Mexican Chicken Tartar burger this week. I, too, was a little confused, because I took Tartar to mean like Beef Tartar (as in rare/raw), but it's actually referring to their Tartar Sauce! It's essentially a big piece of chicken breast that has been breaded and deep fried. The batter and the flavor is really mild, especially after wolfing down the half-mini-bucket of fries, but it was still good. Too bad the special is on Wednesdays where they also have some kind of steak burger. 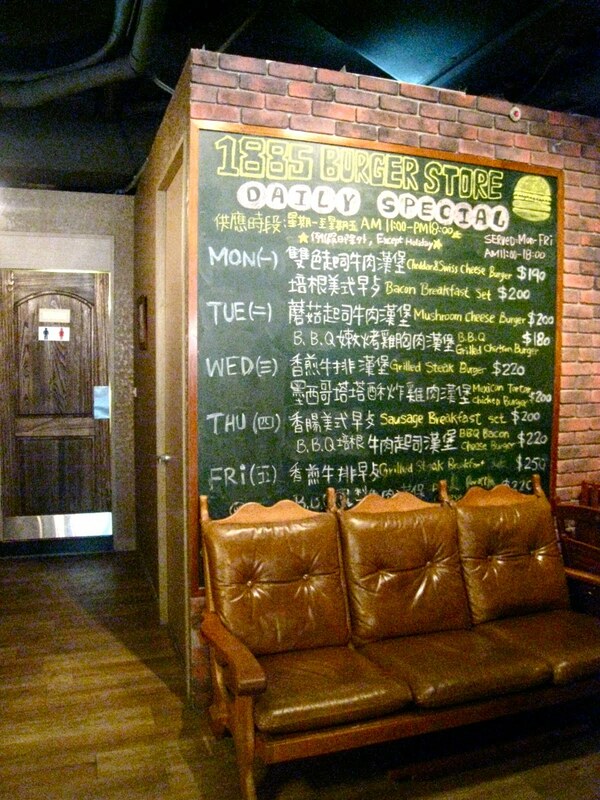 With Burger Stop closing last year and now, Juicy Burger in Neihu bites the dust, I was really bummed out. 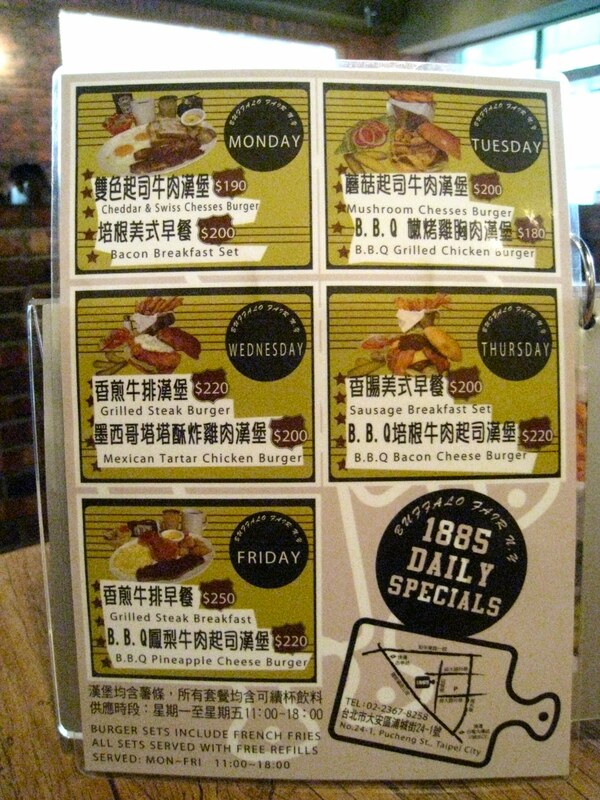 Luckily, I found a 1885 on ShiMing Da Dao to get my burger fix - it's just like the one near ShiDa, but (scooter) parking is nearly impossible here. tell me what makes you hungry!